Finished Bust Circumference: 30 (34, 38, 42, 46)”. 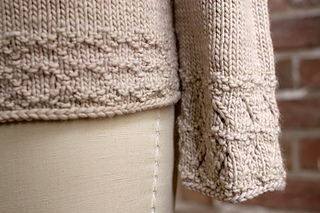 Length: 23½ (24, 24½, 25½, 26)” Sweater shown measures 34”. Finished Bust Circumference: 30 (34, 38, 42, 46)”. Manos del Uruguay MAXIMA (100% extrafine merino wool; approx 100 g/219 yds): 5 (5, 6, 7, 7) sk. US 5/3.75mm ndls, 16“ and 29“ circular and set of 4 or 5 double pointed, or two sizes smaller than size needed to obtain gauge. US 7/4.5mm ndls, 16“ and 29“ circular and set of 4 or 5 double-pointed, or size needed to obtain gauge. 19 sts and 28 rnds= 4“ in Stockinette stitch with larger ndl, worked in rnds. 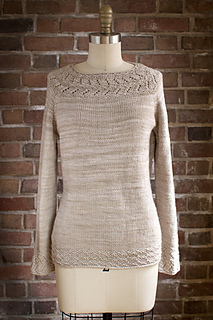 This pullover is worked seamlessly from the top down, in the round. 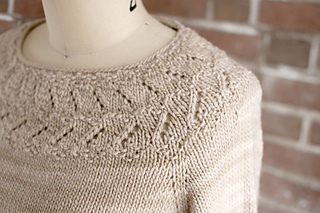 The yoke is worked in a combination of ‘round’ yoke and raglan shaping. Then the body and sleeves are separated and worked seamlessly to the cuff.